Which reagent is better for reducing disulfides, DTT or TCEP? The two reagents are quite different in their reactivity, stability towards oxidation, reaction mechanisms, and other categories. DTT is a thiol-containing reagent, and this must be considered in applications involving thiol labeling. TCEP is charged in solution and should not be used in isoelectric focusing. Aqueous solutions of TCEP are quite acidic (pH 2-3). TCEP HCl is odorless, air-stable crystalline solid, soluble in water at a > 1 M concentrations. It reduces disulfides at room temperature in < 5 min in dilute solutions (5 -50 mM). There is no need to remove TCEP prior to the use of sulfhydryl-reactive labels or crosslinkers. TCEP is selective toward disulfides, and is reactive at a broad pH range. Reduction of disulfide with TCEP. First step is rate-determining, kinetic rather than thermodynamic control. Reduction of disulfide with DTT. Formation of stable cyclic disulfide drives the reaction. This entry was posted in 1D and 2D PAGE, In-gel digestion, In-solution digestion, Sample preparation questions and tagged 1D PAGE, 2D PAGE, in-gel digestion, protein reduction, reducing reagent on May 30, 2014 by Tania. Isoelectric focusing (IEF): active time 5 min per sample, IEF 5-6 hrs. Preparation for the 2nd dimension SDS PAGE: 1 hr. ; necessary reagents and solutions are prepared during the last hour of IEF. SDS PAGE, staining, and de-staining: 2.5 hrs. with de-staining overnight. Protein sample should be lyophilized or precipitated. To keep the ionic strength of the protein solution at minimum, avoid salts. Non-ionic and zwitterionic solubilizing agents could be present, but keep in mind solubility limits. Protein load for a complex sample to be stained with Coomassie is approximately 100 ug. The protein load varies depending on many factors including stain sensitivity, IPG range, or downstream applications (refer to the manual). Protein sample is dissolved in the sample buffer (Bio-Rad cat #163-2106), 125 ul for 7 cm IPG strips and 185 uL for 11 cm IPG strips. The protein solution is pipetted into a channel in a rehydration tray. An IPG strip is placed gel side down into the channel, covered with mineral oil, and left overnight at 4 C.
IPG strips are placed into a focusing tray, covered with mineral oil, and the tray is placed into the IEF cell for 5-6 hrs. 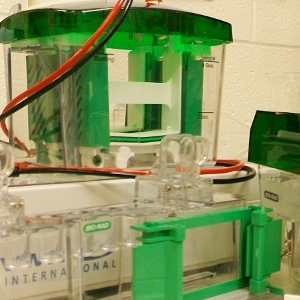 After the IEF is complete, strips are soaked in a reducing buffer, followed by alkylating buffer, rinsed in SDS running buffer, and placed at the top of an SDS-PAGE gel. A molten agarose solution is applied to the well. Once agarose solidifies, the gel is ready for the 2nd dimension electrophoresis. After completion of the SDS-PAGE, gels are rinsed, stained, and destained. Alternatively, the gels can be electro-blotted. What IPG strip is the best for your experiment? Start by choosing the length (7 cm or 11 cm). Short strips are compatible with the Mini-PROTEAN cell, longer strips are compatible with the Criterion cell. All parameters being equal, a larger gel affords better resolution. Next select pH range depending on a type of your experiment: broad range (e.g. 3-10) for a global view, narrow range for a zoom-in view. Please let me know if you are interested in a 2D PAGE experiment! This entry was posted in 1D and 2D PAGE, Sample preparation questions and tagged 2D PAGE, Gel electrophoresis, protein separation, SDS PAGE on May 28, 2014 by Tania. 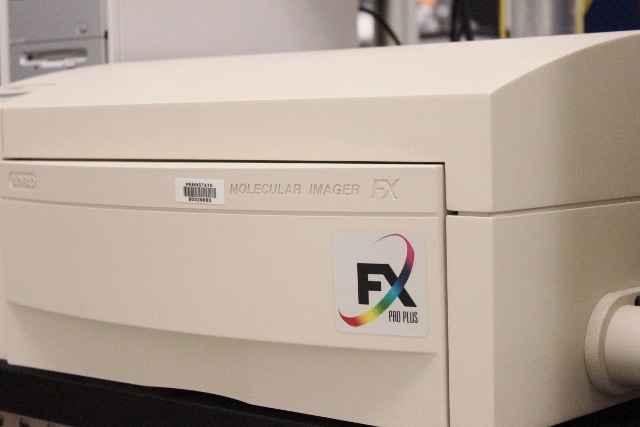 We are giving away a set of gel-imaging equipment. There has been a very small number of requests for use of this equipment even though we offer this service at no charge. 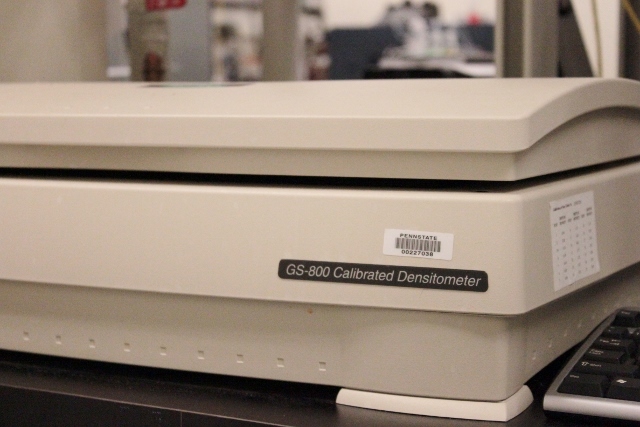 We would like to find a good home for this equipment – hopefully a shared facility – as we are making room for a new mass spectrometer. This entry was posted in Facility news and tagged 1D PAGE, 2D PAGE, DIGE, Gel electrophoresis, gel imaging, SDS PAGE on January 17, 2014 by Tania. 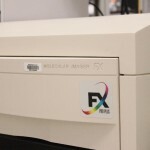 I get a lot of inquiries about our PAGE (polyacrylamide gel electrophoresis) equipment, so here are some information on the equipment we have and the supplies we use. We share our PAGE equipment with you at no charge. You need to purchase your own supplies: e.g. gels, standards, buffers, and other consumables. Sometimes we have supplies left over from the Facility experiments, which we will gladly share with you as well. Please, ask before you buy your own! Our power supply is a basic model; it does not store programmed methods. It can run up to 4 cells simultaneously, as long as the conditions are the same. We have three Bio-Rad electrophoresis cells, a Mini-PROTEAN Tetra for up to 4 mini-gels (8.6 x 6.7 cm), a Criterion cell for up to 2 midi-gels (13.3 x 8.7 cm), and a Criterion Dodeca cell for up to 12 midi-gels. We also have a blotter for 13.3 x 8.7 cm gels. Our PROTEAN IEF cell (Bio-Rad) is capable of storing methods, and accepts 7 cm, 11 cm, and 18 cm focusing trays. We also have rehydration trays for all three IPG (immobilized pH gradient) strip lengths. You can use our gel casting stands and glass plates (0.75 mm) to cast your own mini-gels. In my experience, 1-mm thick gels hold up much better, especially for low %T (4-10%). Bring your own plates if you wish! The Pierce precast mini gels from Fisher are compatible with the Bio-Rad Mini-PROTEAN cell. We do not buy precast gels from Bio-Rad due to the high shipping costs. Fisher orders ship free. You can learn more here. Immobilized pH gradient (IPG) strips are also available from Fisher (GE Healthcare Immobiline DryStrip gels, for example). 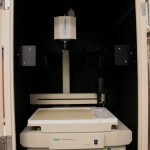 The prices are comparable with the Bio-Rad’s, and the shipping is free. 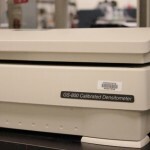 05/28/2014 ETA: According to the GE Healthcare website, Immobiline IPG strips and buffers are not compatible with the Bio-Rad IEF cell running conditions. I am not familiar with the GE system and cannot tell you whether this is true; so to be safe, please use Bio-Rad IPG strips and buffers. 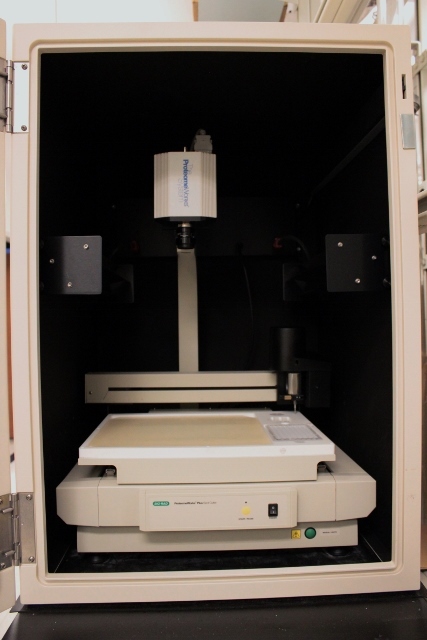 If anyone has successfully run Immobiline strips on Bio-Rad IEF cell, please share with us! This information could save your colleagues both time and money! Disclaimer: We do not receive any form of compensation for promoting any brand or a particular distributor. Still have questions? Let’s meet and talk about your project! This entry was posted in 1D and 2D PAGE, Sample preparation questions and tagged 1D PAGE, 2D PAGE, Gel electrophoresis, protein separation, SDS PAGE, shared equipment on October 4, 2013 by Tania.